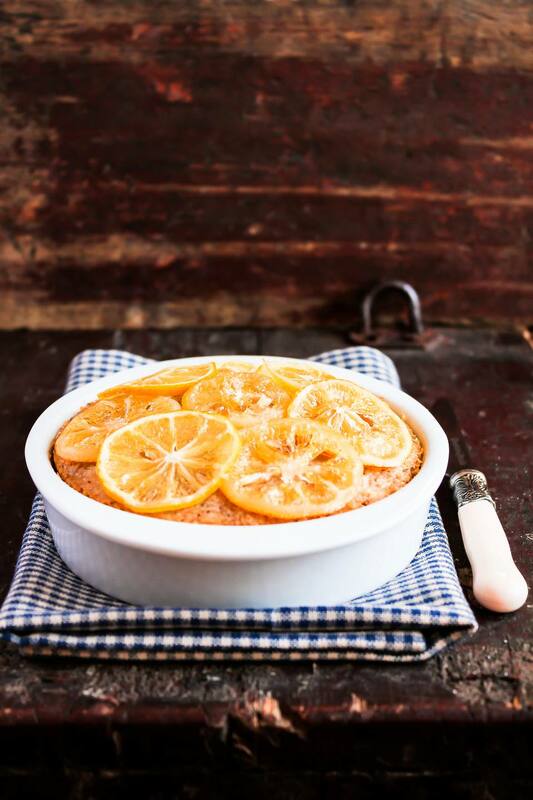 Meyer lemons are uniquely suited to this recipe because of their thin skins and extra sweetness. You'll love using the whole lemons; as they give this cake an intense, complex flavor and there's no waste. It's moist and rich without being heavy, and the tart flavor of the lemons is balanced by just a little sweetness. Wash the skins of the lemons well, then transfer them to a pot and cover with water. Bring the water to a boil, reduce heat, and simmer for a half hour. Transfer the lemons to a bowl of ice water to cool them. When they are cool enough to handle, cut the lemons open and remove the seeds, saving everything else. The insides of the lemons retain heat, so cut each lemon in half and let the cut lemons sit in a bowl for 10 to 15 minutes. They should then be cool enough to remove the seeds by hand. Do this over the bowl so you don't lose any juice. Once the lemons have been de-seeded, put them into a food processor or blender and purée them until they are smooth, like pudding or lemon curd. Set the purée aside. In a clean bowl, beat the egg whites to form stiff peaks, then set them aside. Combine the almond flour, all-purpose flour, baking powder, and salt in a bowl. In a separate bowl, combine the egg yolks and sugar and beat until the mixture is pale yellow. Stir in the lemon purée and almond extract. Spread the batter into the greased springform pan. Bake for 50 to 60 minutes, or until the sides of the cake pull away from the pan and a toothpick comes out clean from the center of the cake. As the cake cools, mix up a glaze by whisking together the Meyer lemon juice and the confectioner's sugar. Spread the glaze evenly on top of the cake while the cake is barely warm. Blanch the Meyer lemon slices for 2 to 3 minutes in boiling water then dunk them into ice water to stop the cooking. Cut each slice in half and arrange them on top of the glaze. This cake is moist, and just sweet enough to be a satisfying dessert while still showcasing the tartness of the lemons. Lazy Cook Alert: Most recipes tell you to beat the egg whites last, but we do it first because we only have one bowl for our stand mixer. If you beat the egg whites first, you can transfer them to a plate and reuse the mixing bowl for the next step without washing it. If you beat the egg yolks first, you have to wash the mixing bowl before using it for egg whites, because the fat in the yolks keeps the whites from getting stiff.